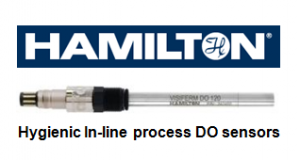 Hamilton DO sensors are inline Dissolved Oxygen Sensors that are easy to use. They are a cost effective quality instrument that measure Dissolved Oxygen in Beer and Wine in either parts per million (PPM) or parts per billion (PPB). An iPhone and Android app make these sensors easy to use and calibrate. Full calibration is easily carried out with the app and a reference gas. Please contact us or visit the Hamilton website for more specific information.